Cut any old woolen articles into long strips, from one to two inches broad. With a pen, write words of power associated with money and draw lucky symbols on the strips, Braid three of these together, and sew the braid in gradually increasing circles till large enough. 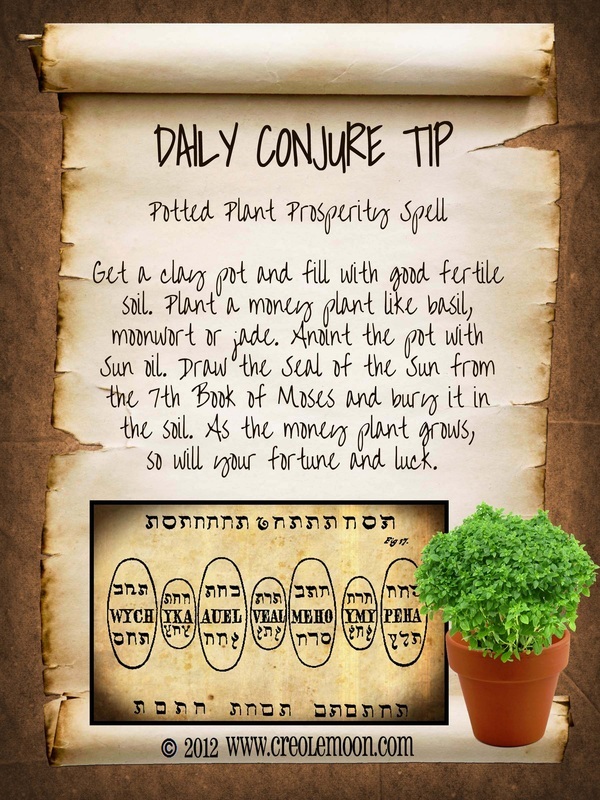 Place outside the front door where it will act as a magnet and draw prosperity to your home. In a bowl, mix one tablespoon of honey with one teaspoon of sugar to form a thick paste. Take a green candle and set it in the mixture; smear some of the mixture to the candle’s top and wick then sprinkle with cinnamon. Just before lighting, take a taste of the honey mixture on your finger and say out loud “sweeten my pockets” (or purse or bank book, as you like). Light candle and let it burn undisturbed (McQuillar, 2003). The black-eyed pea is a type of bean used for prosperity and general good luck in New Orleans Hoodoo. They can be found in any New Orleans style mojo bag even in the little mojo bags that are typically tied to the arms of Voodoo dolls marketed to the tourist trade. Black-eyed peas are usually placed in threes in mojo bags, and combined with High John root, a silver dime and a pinch of five finger grass as an excellent gambling and money-drawing mojo. Place a bay leaf next to a dollar bill in your wallet or purse, and it is said you will always have money. Say your prayers for quick results in the area you need, and then write your petition on the piece of parchment paper and set in the bottom of the lamp. On top of the petition paper place a piece of pyrite, a silver dime, a pinch of magnetic sand, a pinch of the herbs and 5 drops of wintergreen essential oil. Then cover with olive oil and set your wick in place. Light the lamp and talk to it, telling it what you want it to do. State your results. Allow the lamp to burn until the oil has been used or refill as needed. Work the lamp daily until you see the desired results. Keep it burning to keep luck in your favor.